Jeremy’s family minivan helped launch a movement. For his birthday, please help Thrive replace it. Five years ago, our founder Jeremy Del Rio’s family donated their minivan to help create hope and opportunity through arts and mentoring in public schools. Since then, nearly 15,000 NYC public school students and volunteers have transformed their schools and neighborhoods with nearly 45,000 square feet of public art in 89 school and community murals. Delivering materials and staff to every mural site: that trusty 2005 Grand Caravan. 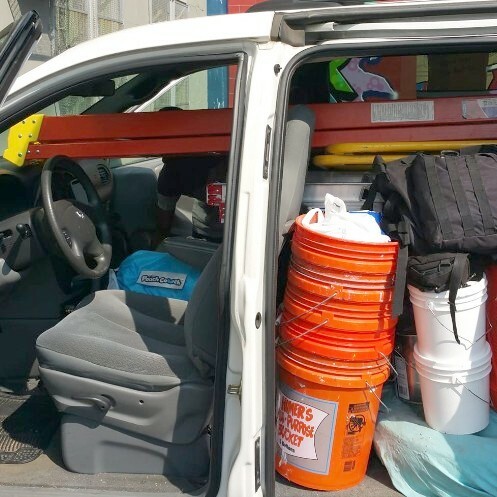 Minivans aren’t made for 190,000 miles, let alone for transporting ladders and scaffolds and lumber and mural supplies. For Jeremy’s birthday this year, help Thrive invest in a proper cargo van as a mobile muraling studio. Every dime you give will help make this possible. 1. Driving like that hurts everybody’s knees. 2. Ladders aren’t the most pleasant passengers. Today, every dollar you give will help Thrive purchase a proper cargo van.